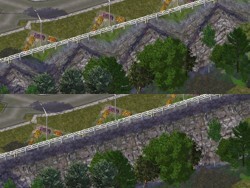 Diagonal Jagged Edges Mod enables creating properly looking diagonal walls on slopes higher than 13,4 m. The DJEM modifies the same parameters as the terrain mod main file, so you should choose version dedicated to the terrain mod used by you. 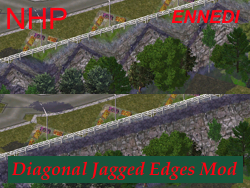 The ZIP file contains DJEM versions for all new Cycledogg's terrain mods, Columbus Terrain mod (including Standard and Snowcapped Versions), Teirusu Arctic and Desert Terrain Mod and the Maxis default terrain. This page was last modified on 16 January 2009, at 16:43.